As the space economy is switching from single satellite infrastructures to constellations of affordable small satellites, network elements inevitably increase in complexity. 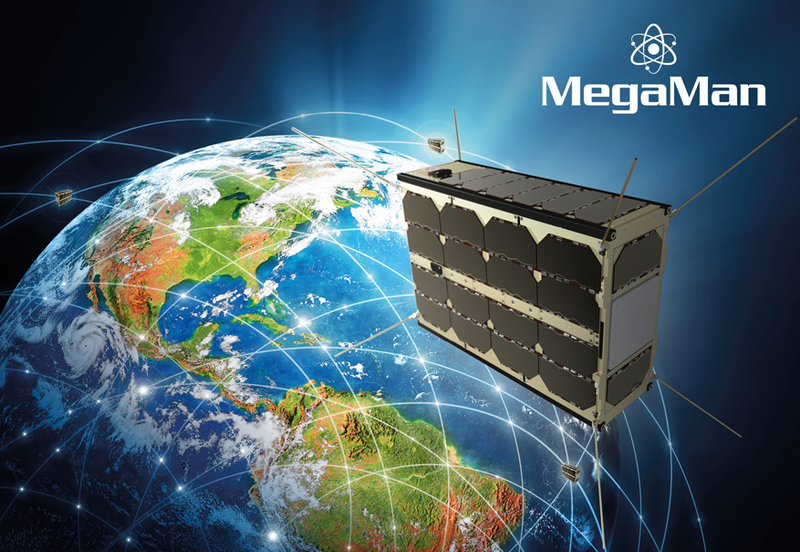 2operate and GomSpace, together with Aarhus University, are working together within the MegaMan project, funded by Innovation Fund Denmark, to evaluate how existing telecom standards and existing artificial intelligence (AI) solutions developed for the terrestrial telecom sector can be leveraged to manage future satellite constellations robustly and efficiently. As part of the collaboration, the partners have successfully evaluated 2operate’s existing AI-based 2solve product using the GOMX-4 satellite mission by GomSpace and the Delfini-1 mission by Aarhus University. The use of 2solve and AI for satellite constellation management help reduce the amount of operator hours required to manage satellite constellations by reducing work-load for network monitoring and for root-cause-analysis tasks, as the AI is trained using expert knowledge to automate these tasks. Further, the automation of these functions means that network incidents can be resolved much faster leading to higher availability of the satellite services. Based on the successful trials, 2operate and GomSpace have signed an MoU to strengthen the companies’ collaboration and to prepare introduction of the 2solve AI-capabilities through GomSpace’s Mega-Constellations Operations Platform (MCOP) being introduced by GomSpace’s subsidiary in Luxembourg. “It is very exciting for us to see how the lessons learned from the terrestrial telecom sector can boost the uptake of advance network management solutions for space – and how well our product adapts to the new requirements”, says Christian Ingerslev Sørensen, CEO of 2operate. “Being able to operate satellite constellations 24/7 with the highest availability is a key capability for GomSpace, and being able to integrate proven solutions reduces both risk and required investments”, says Niels Buus, CEO of GomSpace. 2operate and GomSpace last week jointly exhibited at the World Mobile Congress in Barcelona, showcasing how the application of the 2solve product applied to satellite mission management. Join us at Mobile World Congress in Barcelona, 25-28 February 2019 where will showcase our latest solutions within network assurance, site configuration management and service quality classification. Visit our booth at the Danish Pavilion in Hall 6, stand no. 6C50. Panama City – July 24, 2018 – During the CANTO Caribbean 2018 conference dinner, 2operate was presented as the winner of the CANTO Innovation Award for its project to set up effective mobile network monitoring for Sint Maarten-based service provider, Telem, based on its innovative 2solve network assurance platform..
Lars Moltsen, Chief Science Officer at 2operate said: ”It is a great pleasure to receive this award for our collaboration with Telem in the past year. Telem is our first customer in the Caribbean market, and we are impressed by the maturity and customer focus of their organization. We surely will continue serving them in the future with greatest dedication”. Eldert Louisa, CTO at Telem said: ”We have established a new and highly effective network operations unit making use of 2operate’s 2solve solution to ensure excellent network quality to all our customers. 2operate has been very efficient and a great partner, listening to our needs during the project, and we trust them to keep up the good work for us in the future”. The CANTO Innovation Awards are biennial awards honouring the highest achievements from the Mobile sector of the Information and Communications Technology (ICT) industry, celebrating organizations that are blazing a trail within the sector. These inaugural awards will recognize and celebrate members that demonstrate excellence and innovation in service creation and delivery with the most advanced technologies, exercise modern operational methods and performance management, while making a solid contribution to Caribbean communities. At the CANTO 2018 conference, 2operate also signed a partnership with regional solution provider Ictual. Information about this year’s CANTO conference can be found at this link. Photos from the Innovation Awards ceremony can be found at this link. 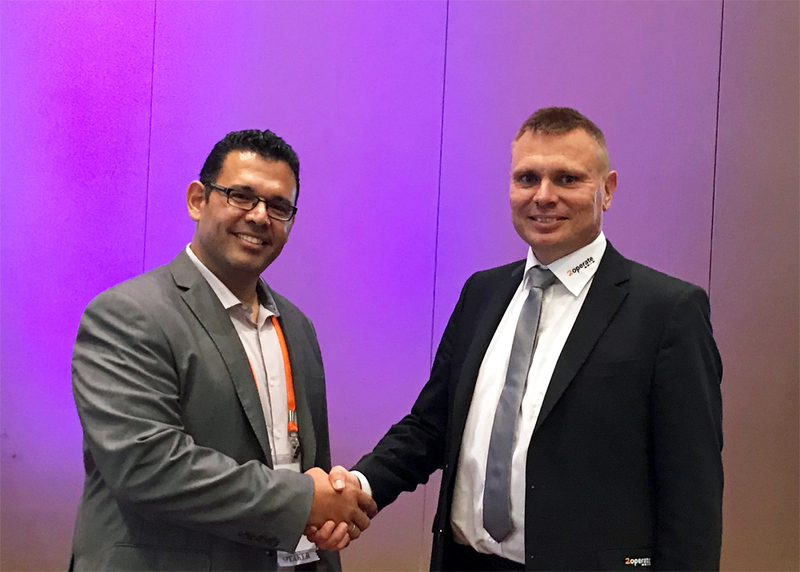 Today at the ongoing CANTO conference in Panama City, the two telecom solution providers, Ictual and 2operate, announced that they will be partnering on network management solutions for the Caribbean market. With its 2solve platform of solutions, 2operate helps mobile network operators worldwide to establish efficient work processes in customer care and network operations. These offerings will now be available throughout the Caribbean with local support from Ictual, who is well-known in the region for its high-quality ICT services and solutions. “We are excited to strengthen our presence in the Caribbean with this new partnership with Ictual“, said Christian Ingerslev Sørensen, CEO at 2operate. “Ictual’s experienced, pragmatic IT professionals will be an important asset for our expansion in the region“. “2operate is a true innovation pioneer, and we have great expectations for this new partnership“, said Andrew Solomon, Managing Director at Ictual. “We want to make sure that our customers here in the Caribbean have access to the latest and smartest technology from around the world“. The two companies were represented at the CANTO conference by Geraume Bor, CTO at Ictual, and Lars Moltsen, Chief Science Officer at 2operate (photo at the top). Ictual is a high quality and innovative solutions provider in Telecom, Finance and Government markets. With knowledgeable and experienced IT professionals Ictual offers tried and proven solutions based on leading technologies. Ictual is more than an ICT vendor always aiming to provide more value and benefits to you as our valued customer. Headquartered in Curacao Ictual also has extended operations into The Netherlands. For more information visit www.ictual.com. 2operate will be joining industry leaders from the Caribbean at the upoming CANTO Conference in Panama City July 22nd-25th. Meet us for a chat and learn how we help mobile and satcom service providers achieve significant efficiency gains by making key network configuration, management and fault-finding procedures simpler and less prone to inconsistencies and errors. 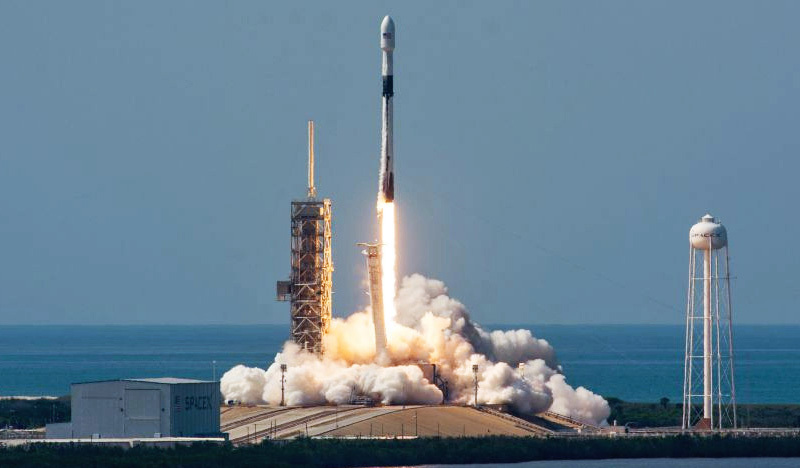 On Friday, May 11, 2018, the first commercial telecommunications satellite from Bangladesh was launched by a new SpaceX Falcon-9 Block 5 rocket. This also marked the start-up of the first 2operate management system for space. The newly-developed SpaceX Falcon-9 Block 5 launch vehicle orbited the Bangabandhu-1 satellite from Kennedy Space Center in Florida on May 11 at 22:14 CET. The satellite was developed by Thales Alenia Space and will be operated by Bangladesh Communication Satellite Company Limited (BCSCL) from two control centers in Gazipur and Rangamati. 2operate’s award-winning 2solve solution is an integrated element of the management platform in these control centers. Bangabandhu-1 is Bangladesh’s first commercial satellite, providing broadcasting and telecommunication services to rural areas of Bangladesh and its neighboring countries. 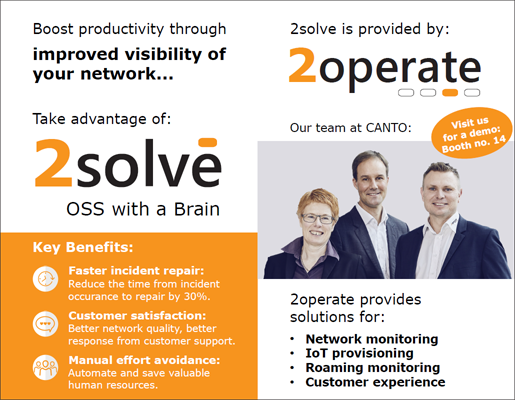 2solve helps network operators to establish efficient work processes in customer care and network monitoring. The solution is unique by exploiting advanced algorithms to achieve automated incident diagnostics, thereby improving the overall productivity of network operations. “We collaborated with Thales Alenia Space to integrate a turn-key management platform over the past year“, said Christian Ingerslev Sørensen, CEO at 2operate. “The satellite launch today was of course a major milestone for the project“. 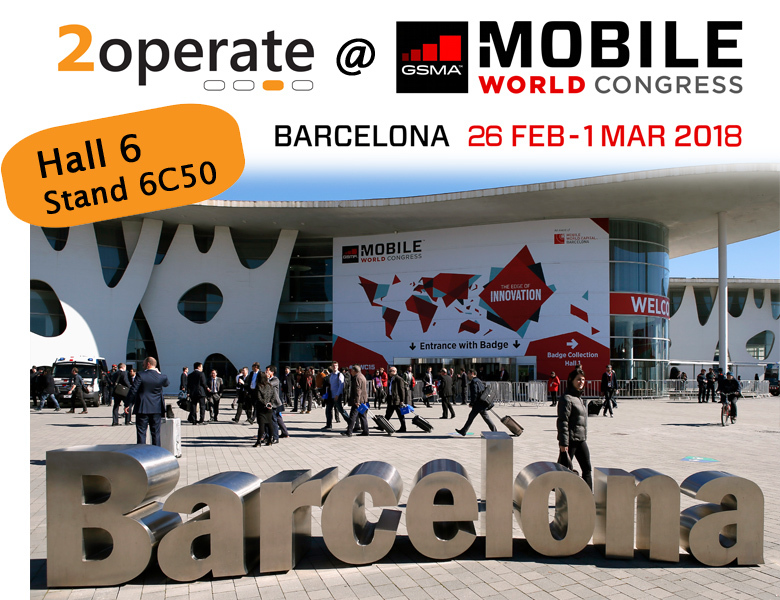 Barcelona, Spain – February 27, 2018 – Prior to this year’s Mobile World Congress, 2operate had announced two new products, 2solve Service Classifier and 2solve Site Configurator. Today at the conference, a first contract was signed with TELE Greenland for the installation of 2solve Service Classifier on top of the already-deployed 2solve platform at TELE Greenland. 2operate has been selected by TELE Greenland to provide 2solve Service Classifier, a new module for the 2solve platform which helps operators visualizing and understanding network coverage. 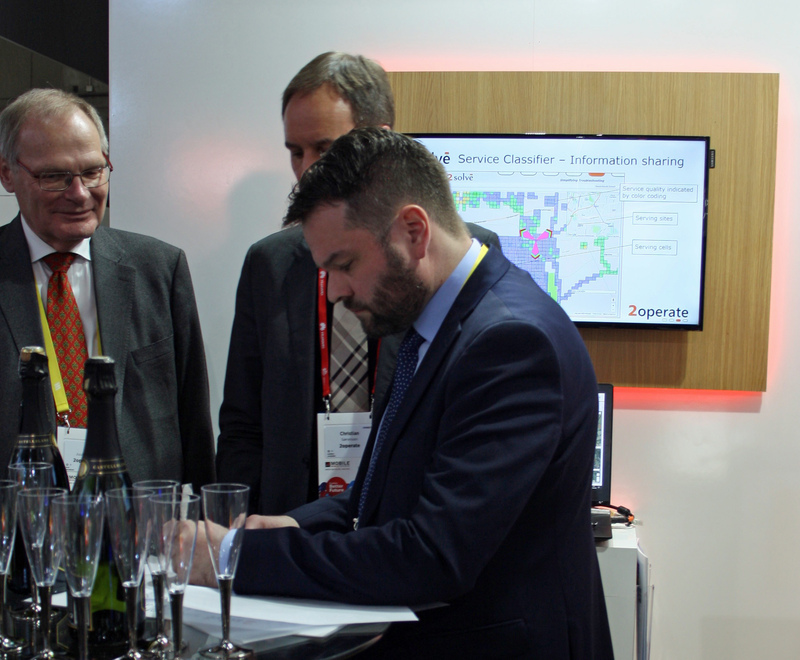 The new contract was signed at 2operate’s stand at Mobile World Congress by Kristian Davidsen, CEO of TELE Greenland, Christian Sørensen, CEO of 2operate, and Kaj Juul-Pedersen, Chairman of the Board at 2operate. 2operate is a front-runner in network operations simplification. Our aim is to reduce complexity and enable automation of manual processes. This is accomplished through hands-on experience from many years in telecommunications operations combined with world-class software engineering skills. 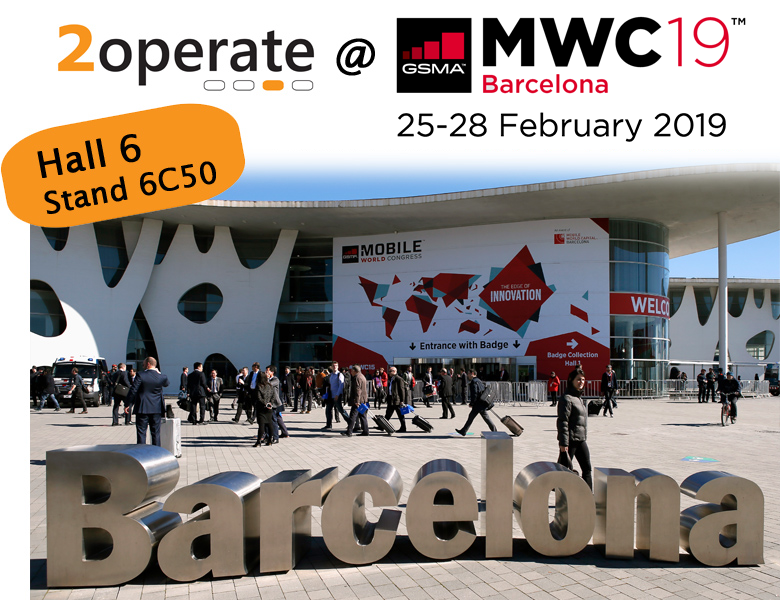 2operate will exhibit at Mobile World Congress in Barcelona, 26 February-1 March 2018. Meet us there for a chat about efficient and effective network operations. New this year will be automated site configuration and service quality classification (find information about these at the Solutions Descriptions page). Find us at our booth in Hall 6, stand no. 6C50 (look for the “Denmark” pavilion). We look forward to meet you there! A new Danish R&D project will reduce the complexity of satellite mega constellations by exploiting existing standards from cellular networks. The project is headed by network operations software specialist 2operate in collaboration with nanosatellite pioneer GomSpace and Aarhus University. Satellite mega constellations are about to revolutionize satellite-based telecommunications services. Traditional satellite communication based on geo-stationary satellites in orbit at 36,000 km. above the Equator imply a roundtrip delay of at least half a second. Mega-constellations of satellites in low orbit (around 1.000 km.) will reduce roundtrip delay to less than 100 ms. between most locations on earth. Moreover, the coverage, scalability, and flexibility properties of mega constellations outperforms geo-stationary satellites. “It is obvious that the solutions and standards developed for the operations of “constellations” of cellular network elements may be reused for mega constellations“, said MegaMan project manager, Lars Moltsen, who is also the Chief Science Officer at 2operate. “By doing so, we expect to skip 2-3 years of maturity time compared to the default approach of re-inventing everything. Right now, focus is to ensure connectivity, but we know that as soon as the new mega constellations enter operation, the operators will start demanding efficient solutions for daily operations“. 2operate will exhibit at the upcoming CANTO event in Punta Cana July 16th-19th. Meet us there for a chat about our visions for simplifying network operations and hear how we have been breaking new ground with our Site Configuration Management Solution.